This is a wrongful death medical malpractice case filed by a Montgomery County family after the death of their father/husband. Plaintiffs allege that the decedent should have been referred for a preoperative cardiac evaluation before clearly him for surgery. This case was filed in Health Claims Arbitration on August 3, 2016, and is the 379th medical malpractice case filed in 2016 in Maryland. The Montgomery County Circuit Court case number is 423906V. A 64-year-old male is a patient of defendant doctor at Family Medical and Rehab Center in Gaithersburg. He begins to complain of lumbar back pain and is considered for lumbar surgery. He has a well-known past medical history significant for cardiac disease, with labs indicating aortic valve dysfunction, and has been under the care of a cardiologist. He goes to defendant doctor to obtain clearance for his lumbar spine surgery, which is given after only an electrocardiogram (EKG). 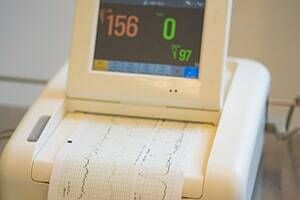 The EKG indicated persistent right bundle branch block, which requires a referral, according to Plaintiff's expert, a trip to a cardiologist prior for clearance for the man's surgery. Since permission was given with the cardiologist referral (as opposed to contingent upon) the man undergoes the spinal decompression and fusion and is discharged home. That evening, he is found unresponsive. Resuscitative efforts fail and the man dies. Plaintiffs claim the subsequent autopsy reveals that he died of the result of the stresses of surgery superimposed on his cardiac condition. He brings a claim against the doctor and medical facility, alleging that his cardiac disease was too serious to permit the elective surgery, and the doctor should have realized this. If the defendant doctor properly referred the man to a cardiologist for evaluation, the surgery would not have gone forward, and he would not have died. This is a failure to obtain a preoperative cardiac consultation. The purpose of a cardiac consultation is not for the cardiologist definitively opine that there will not be a cardiac event. In a case like this, the purpose get information on the cardiac risk so the doctor and patient can balance the risk with the need for surgery. While the patient was being followed by a cardiologist, a preoperative cardiac evaluation may have given a more current view of the risk of surgery so that he would have gotten treatment to better tolerate the surgery or a decision would have been made to delay the surgery. One key question is going to be when this man last saw his cardiologist and what tests were done for him before the surgery. The doctor is going to argue that the cardiac consult would not have turned up anything of significance that would have led the man to avoid surgery. Noncardiac surgery can put patients at greater risk for a cardiovascular event. The risk is based on a plethora of variables that are specific to the individual patient and the procedure. Another critical issue is going to be how urgent or necessary the procedure was. In this case, we are talking about spinal surgery where the timing of the surgery was unlikely to be critical. What the ACC/AHA guidelines perioperative cardiovascular evaluation for noncardiac surgery say about this particularly EKG finding will be important. The details of the victim's prior medical history of aortic valve dysfunction and other cardiac issues are also going to be important. If you have suffered as a result of the negligence of a doctor, nurse or hospital, our law firm can help you get the justice and monetary compensation you deserve. Miller & Zois has a very long history of results in medical malpractice cases in Maryland, earning large verdicts and settlements. Call today to speak with a caring medical negligence attorney who can help you at 800-553-8082 or get a free online case review. Looking for co-counsel for your medical mistake lawsuit? Learn more about what Miller & Zois can deliver to you and your client to increase the settlement and trial value of your case. Our firm will split attorneys' fees with co-counsel consistent with the Maryland Rules. CALL 800-553-8082 or get a free online medical negligence serious injury and wrongful death claims. Miller & Zois handles medical mistake claims throughout the entire state of Maryland and in Washington, D.C.